At West Broadway Dentist, we offer a full range of preventive, restorative, and cosmetic dental treatments to keep your smile healthy and bright. Step into our office and you’ll find a warm, welcoming environment where dental services are demystified and your health and comfort are our primary concern. As owner and operator, Dr. Fereidouni is personally invested in your happiness and care. He has worked diligently to create an atmosphere where customers enjoy a sense of genuine care and concern from their dental care providers. You’re met with compassion everywhere from the front desk to the examining room. At West Broadway Dentist, we’re equipped to provide both necessary and elective dental procedures. Whether you’re seeking a solution for tooth pain or looking for a whiter smile, Dr. Fereidouni and his staff can help. Dr. Fereidouni has 25 years of experience as a dentist, providing patients with decades’ worth of expertise to help guide their dental decisions. Our office also welcomes Dr. Amir Ajar twice a month for surgical dental procedures. Dr. Ajar has the same dedication to caring service, making a perfect complement to the dental team here at West Broadway. If you’re unsure of your dental needs, we can help. Book an appointment for a general consultation or come in for your regular cleaning and exam. Dr. Fereidouni will be happy to discuss any questions or concerns you may have and help you select the right treatment plan for your personal needs. We address every patient as a unique individual and create personalized plans to suit your distinct requirements. Conveniently situated near your home or office, our location is easy to reach for residents throughout the Vancouver area. We welcome new patients. If you’re ready to schedule a visit, you can request an appointment time online in just a few clicks. Our friendly office staff will get back to you shortly to offer a selection of appropriate appointment bookings. If you have questions or concerns, you can give us a call anytime at 604-731-5576. Our staff at West Broadway Dentist is committed to helping you book a successful dental appointment that will address all your needs and leave you with a healthy, sparkling smile. 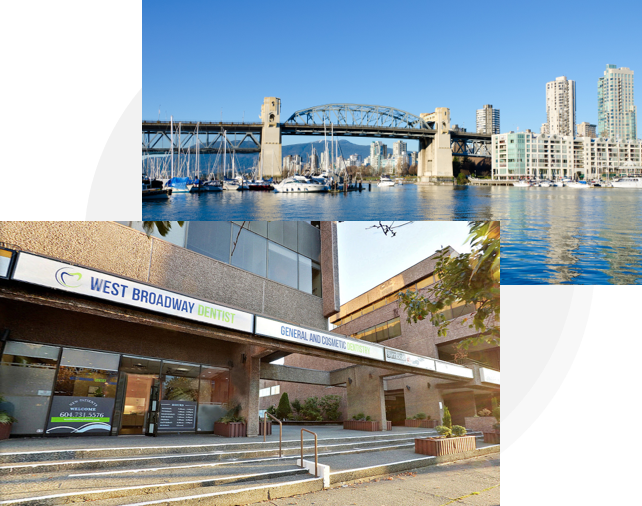 Our office is conveniently located on West Broadway near downtown Vancouver. Situated between Burrard Street and Granville Street, we’re easy to reach. We have two reserved stalls in the underground parking below our office and street/metered parking in the front of our office. You’ll also find several options for free parking within half a block of the building and paid parking available in the close vicinity. Our office is conveniently located on West Broadway near downtown Vancouver. Situated between the neighbourhoods of South Granville and South Cambie, we’re easy to reach. Our office has two reserved parking spaces in front of the building. You’ll also find several options for free parking within half a block of the building and paid parking available in the close vicinity.